Less chair time with Solea Laser! Get back to your day quickly without being numb for hours. Solea Laser eliminates needles and anesthesia for most procedures. It’s pain free dentistry and you won’t pay more for it! 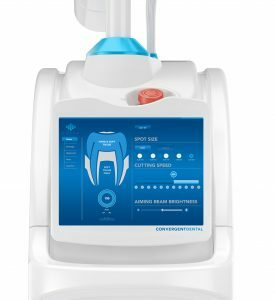 At Krupka Dental Associates, we are proud to offer Solea® Laser Dentistry to our clients. With the use of lasers, we are able to shorten your treatment time, and avoid anesthesia. With this technology, we can remove tooth decay and fill your cavity on the day it is detected. If you would like to learn more about how our dentist, Dr. John Krupka, uses laser dentistry in Kaukauna, Wisconsin, call 920-766-1122 today. Laser dentistry involves the use of dental lasers to complete treatments more comfortably, quickly, and effectively. At our dental practice, we are dedicated to always providing you with the best possible dental care. Our dentist and team continuously update their education and our office to provide you with a more pleasant and efficient dental visit. We are proud to offer laser dental treatment to ensure that your dental experience is comfortable and positive. Q: I heard about anesthesia-free, no needle procedures (Solea), can you tell me a little more about it? A: Solea is a dental laser that we use to replace the drill for cavities and the scalpel for gum surgery. A: With Solea we don’t have to give you a novocaine shot for the majority of procedures. The appointment is faster because we don’t have to wait for you to get numb. A: Since we don’t administer novocaine for the majority of procedures, you won’t leave with a numb lip after the procedure, so you can eat and drink right after your appointment. A: We can also do multiple procedures in one appointment because when we don’t have to use novocaine, we can work in different areas of your mouth. Q: What types of procedures can be done with Solea? A: The majority of procedures can be done with Solea – from cavities to oral surgery, with the exception of root canals and endo. Q: I need gum surgery, can you use Solea on me? Or, I need cavities filled, can you use Solea on me? A: You’ll need to come in for a consultation before we can answer that question, but for the majority of gum surgeries, with Solea you’d experience virtually no bleeding, since the laser cauterizes as it cuts, there are no stitches, less post-operative pain, and for most cases you won’t need a shot. For the majority of cavities the procedure will be anesthesia-free, needle-free, drill-free and virtually pain-free. Q: Is Solea really pain-free? A: For the majority of procedures Solea is pain-free, some patients tell us that they feel cold air, but no pain. Q: Is Solea covered by insurance? A: Yes, it is. Solea procedures are covered the same way traditional procedures would be covered. Solea is a new technology we’re using that’s replacing the drill, so billing codes are the same. Q: Is Solea good for kids? A: It’s great for kids. It’s faster, for most procedures they don’t need a shot and we don’t have to use the drill for cavities or scalpel for gum surgery. They won’t have a numb lip, so they can eat and drink right after their appointment. Q: I’m pregnant. Is it ok to use Solea on me? A: Yes, it’s actually better for you since we don’t have to inject with you anesthetic for the majority of procedures. Q: Is Solea safe? Do I have to worry about radiation? A: Yes, it’s safe. Solea is a medical device that has been cleared by the FDA to cut enamel, gums and bone. All you need to do is wear protective eyewear that we’ll provide during your appointment.